One of the most famous historical landmarks in the valley is St Peter’s Church in Windermere, known far and wide as the Stolen Church. Its history goes back to the 1880s ghost town of Donald, northwest of Golden. The church simply vanished! Who stole it? How did they do it? What was the motive? What were the consequences? If you want to find out, come to a musical mystery theatre production at 2:00 pm on Sunday, August 21st at St. Peter’s – located on the corner of Kootenay Street and Victoria Avenue in Windermere, about two blocks from Windermere Community Hall heading down towards the lake. 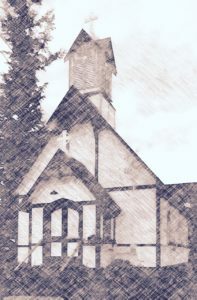 St. Peter’s celebrated the 100th anniversary of its disappearance from Donald and placement in Windermere back in 1999. At that time, Helen Kipp wrote a play in verse about the church, and asked Barry Moore to compose music to her words. He came up with seven dramatic tunes to help tell the story. Their musical was presented a few times that year, and revived in 2003 at an Edgewater variety show. The tale is full of romance, mystery, colourful East Kootenay historical characters, and original music in the rollicking style of the gold rush days.